Where are the best medical sales jobs? Which top medical sales companies are viewed as the best employers? Over 1,400 members of the MedReps community cast their votes for companies of all types and sizes to identify the Best Places to Work in Medical Sales. Johnson & Johnson, Medtronic, and Stryker claimed the top spots overall, but winners were also named in the categories: best medical device companies to work for, best pharmaceutical companies, and best biotech companies. See the full list of winners to the left or view the infographic. Over 1,400 medical sales professionals participated in the survey this year, either writing in their votes or selecting from a list of Fortune 1000 companies and companies nominated by the MedReps community. Not surprisingly, the biggest, most well-known companies were chosen most frequently, but companies of all types and sizes received votes, giving us a lengthy list of top medical sales companies to consider. In addition to the total number of votes a company received, we also considered the number of votes from current medical sales employees, as well as their comments, to determine the final list of winners and honorable mentions. Companies specializing in medical devices and equipment certainly had an edge in this year’s survey – 63% of respondents said they prefer to sell devices or equipment. A majority of respondents also said they prefer to work for small or medium-sized companies, which explains the high volume of write-in votes. 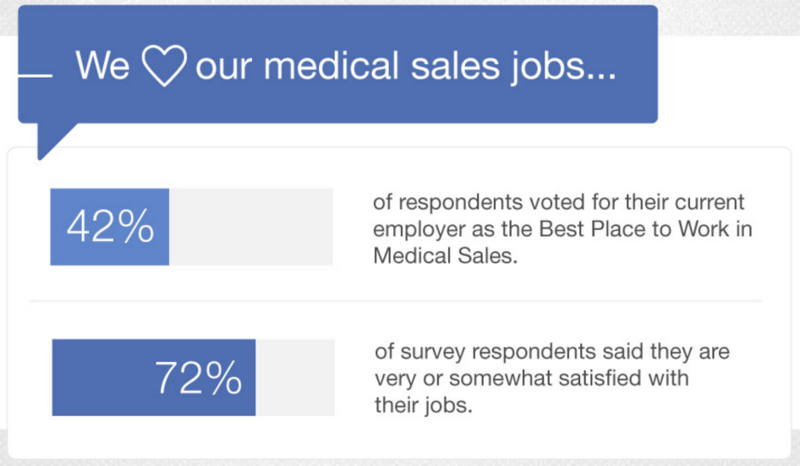 The survey also asked questions about the qualities medical sales reps find most important in a potential employer. Over half of respondents (52%) said a strong product line is the most important factor when evaluating top medical sales companies. They want to know that the product they’ll be selling is wanted and needed by their customers. Ideally, they want to sell a product that truly makes a difference in patients’ lives. When asked “What is the best part of your job?” respondents overwhelmingly cited the products they sell and the ability to save lives through those products. The best medical sales jobs allow med reps to make an impact. For some respondents, a strong current product offering isn’t enough – they want to know the company is committed to innovation through research and development. Approximately one-third (30%) of survey respondents said this was the most important quality in a potential employer. Brand recognition (11%) and strong financials (8%) did not carry as much weight. When asked about corporate culture and employee growth, respondents gave competitive compensation (66%) and work-life balance (62%) the highest importance. These answers were consistent with the 2014 results, but it’s interesting to note that the difference between the #1 and #2 spots is getting smaller. Last year, 71% placed compensation in their top two values, and 58% said work-life balance. This year, the numbers were 66% and 62%, respectively. Clearly, work-life balance is gaining in importance, carrying almost as much weight as compensation with this year’s respondents. The takeaway: Medical sales representatives are happiest when they are selling products they believe in for medical sales companies who offer competitive compensation and encourage work-life balance. Click to Tweet: Med reps are happiest when they’re selling products they believe in. This year, 4 in 10 survey respondents voted for their current employer as the industry’s Best Place to Work. Their often passionate comments were weighted heavily in determining our list of final winners. The things they love best about their medical sales jobs? Autonomy and the potential to impact the lives of patients. Having a strong team and great relationships with management were also frequently mentioned. The most frequently mentioned downsides to the job were administrative work and travel. While 72% of survey respondents said they are very or somewhat satisfied with their jobs, nearly half of respondents said they are likely to leave their job in the next year. With mergers and acquisitions at an all time high and an ever-changing medical marketplace, it’s no wonder many medical sales professionals stay ready for change. The takeaway: Job satisfaction among medical sales professionals is high, but the climate of the industry keeps sales reps open to the potential for change. Click to Tweet: Job satisfaction among med reps is high, but 47% say they might leave their job this year. 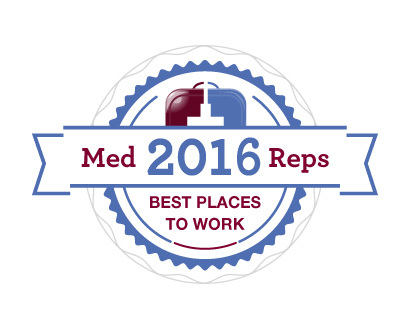 Big-name companies continue to dominate the MedReps Best Places to Work in Medical Sales list. However the number of respondents voting for smaller, lesser-known companies is on the rise. The great news is that strong medical sales professionals can find job opportunities at companies of all types and sizes. From industry giants to small start-ups, medical sales professionals have an array of choices where they can do what they do best. To stay plugged into the best medical sales jobs from companies big and small, join the talent community on MedReps.